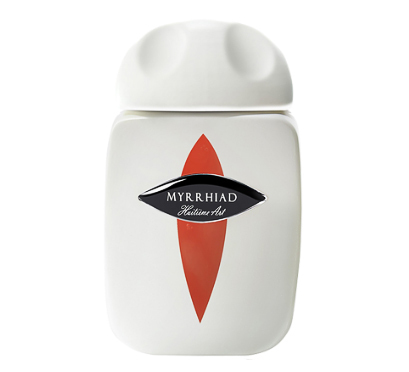 Myrrhiad was created by Pierre Guillaume in 2011 and includes notes of myrrh, black tea absolute, vanilla and licorice. Myrrhiad is the ninth perfume in his new line that launched earlier in 2011. Huitieme Art features eight other perfumes with very short notes lists. Expect reviews of the entire line in the coming weeks. I was expecting a lot from Myrrhiad. It is known that I like resins a lot, and admire PG as a perfumer, so I wanted to be bowled over by Myrrhiad’s beauty. I was not bowled over. Myrrhiad had a hard time living up to my expectations, I guess. But what got to me the most, was that Myrrhiad, from the very first whiff, is so very familiar. I know this perfume and it holds no surprises, that is what my brains wants to tell me. If you never before smelled a perfume of this kind before, you will be excited and probably fall in love. For those of us familiar with one or another myrrh, labdanum, amber, vanilla centered perfume, Myrrhiad doesn’t add much that is new and different to the genre. It smells warm, cosy, comforting, comfortable, is highly wearable and lasts for a long time with slightly lower than average sillage. Other than that it leaves me slightly at a loss. Nothing inspiring comes to mind, I don’t mind wearing it, but I don’t crave it and I didn’t miss it, once my sample was empty. Myrrhiad is beautiful, like a swan gliding over still waters – a single swan, mind you! I happen to live near a lake where there are dozens, even hundreds of swans. That does slightly take away from appreciating their beauty. 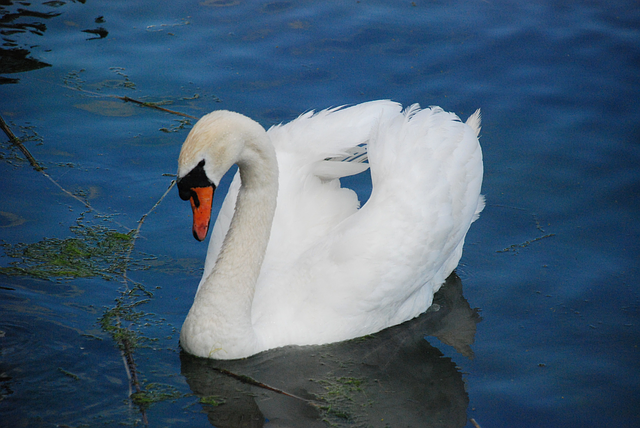 If you don’t know many swans, Myrrhiad might make you very happy. This entry was posted in Amber, Fragrance Reviews, Gourmand, Huitième Art, Myrrh, Resins, Vanilla and tagged Fragrance, Huitième Art, Myrrh, Perfume, Pierre Guillaume, resins, Review, Vanilla. Bookmark the permalink. I’m with you on Myrrhiad. It’s very nice, but there are many other more interesting myrrh perfumes that it doesn’t really wow me. Still, it is very nice. I’m so glad to hear you feel the same. It is very nice, but knock-your-socks-off great? No. Exactly. My socks stayed firmly in place. Over the years it became more and more difficult to knock my socks off perfume-wise – respectively, these days my socks are more often moved by perfumes, which were here with us for ages already (see Jicky…). For me that’s the revelation of the last few years of my perfumania. Sooner or later, I think we all seem to come to this stage where it all looks like been there, done that. But the great classics and the few really great new scents stand out. Being newer at this I still get my socks knocked off from time to time, but even at my slower pace it seems like a lot of perfumes get a rating of 3, which means essentially: nice, just…. nice. In my head I refer to it as “the dreaded 3” because these perfumes leave little impact, don’t move me to loving or hating, they just kind of sit there. Why does it tickle me so that you live near a lake with hundreds of swans? The Loony Tunes version of the Blue Danube has entered my head, and it will not leave (I loved it so much as a little girl!). Did you try Myrrhiad yet? Oh no, I haven’t tried anything from this series yet… but one day I’ll get round to them. As a regular reader of OT, I would say that your socks are blown off – or ruckled round your ankles at least – fairly often by the perfumes you select for review, so it is quite significant when you are underwhelmed by a scent. I liked this one, but I must say the licorice note bothered me. Which apparently is not even in the composition, but a “chimera”, however, as chimeras go, it seemed pretty prominent to my nose! Normally I only review the sock rucklers, but some new releases are worth a look, I think, even if I am underwhelmed. But there are a few nice ones. What a lovely review, fair and evocative, and that all for a perfume that was rather underwhelming! Thank you for sharing it. My brain has a hard time with this line and sentences like “the ninth perfume from eighth art”. I can’t sort out – are there eight or nine? Numbers shouldn’t be in product line names! I sampled most of the HA and Myrrhiad is the one I liked the most. I still have half a decant left for next winter, since I have not yet made up my mind if it is full-bottle-worthy. I liked it too, but it just did not wow me. That goes for the entire line, actually. Oh I agree. I checked my MUA reviews, I reviewed 6 out of 9 and gave them all 3 out of 5 stars (meaning they are mediocre). I personally think PG is launching too many fragrances at too fast a pace.